George Zimmerman was rebuffed by a Florida judge in his request today to remove the GPS tracking device he must wear and be allowed to leave Seminole County so that he would not have to live in hiding while awaiting trial for shooting unarmed teenager Trayvon Martin. Zimmerman, who is currently out of jail on a $1 million bond, appeared in court today, noticeably stockier, clad in a dark suit and presumably a bulletproof vest as he typically wears in public. In seeking permission to remove the tracking device, defense attorney Mark O'Mara put Adam Vincent, Zimmerman's probation officer, on the stand. 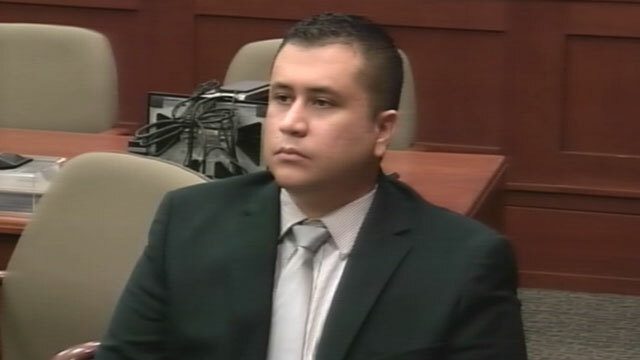 Vincent testified that Zimmerman has always complied with the terms of his probation. O'Mara argued that Zimmerman has "shown himself where he should be free" and should not be restricted to Seminole County because it does not allow him to speak with attorneys, expert witnesses or to help his attorneys prepare for the upcoming trial. Zimmerman "shouldn't have to be in hiding," O'Mara told the court. Zimmerman, 28, has been in hiding since he received death threats following the shooting death of the unarmed teenager on Feb. 26. Lead prosecutor Bernie De La Rionda argued that the state "objects strenuously to any modification of his GPS or his boundaries" and reminded Judge Debra Nelson that Zimmerman lied to the court about how much money he could provide for bond and neglected to mention the existence of a second passport. De La Rionda argued that the GPS is as much for Zimmerman's protection as it is for the state's benefit. "Isn't the defendant safer if law enforcement knows exactly where he is?" De La Rionda asked. The judge denied Zimmerman's request, requiring him to continue wearing the GPS tracker and remain in Seminole County, except to visit his attorneys in Orange County. The two sides also wrangled over identifying the voice heard screaming for help during the deadly confrontation between Zimmerman and Martin. Members of Zimmerman's family said the voice was his, while Martin's family claimed the voice belonged to the teenager. Martin's father initially said the voice was not his son, but when he heard it with heightened clarity, said it was Trayvon. Defense Attorney Don West argued that the defense is obligated to know which witnesses have heard the audio and identified who it was yelling on the calls. The judge countered, saying that anyone could have now heard the audio on the internet and that the prosecution has no greater obligation than to disclose whether or not each witness made a statement to law enforcement. The hearing, like previous hearings, turned into a mini-trial complete with witnesses and cross examination. At one point in today's court session the prosecution brought up Zimmerman's comments on MySpace that made derogatory statements about Mexicans, while the defense showed newly released color photos of Zimmerman's bloodied and bruised nose taken the night of the shooting. Zimmerman is charged with murder, but he claims he shot Martin in self defense while struggling over his pistol after Martin knocked him down and bashed his head against the cement. The trial is scheduled for June 13.